Blizzard is in the giving spirit for Hallow's End, offering players free Arena tickets. But Arena is going to have a bit of a twist for the holiday season. Blizzard is getting into the Halloween spirit across several of its games. The Hearthstone team previously pointed to a new Warlock hero that's being distributed at Fireside Gatherings starting today. But there appear to be more Hallow's End treats on the way. From Tuesday, October 24 through Monday, October 30, Hearthstone players can log in for a free Whispers of the Old Gods card pack. They'll also get a free Arena ticket (valued at $1.99 or 150 Gold) for one Arena run. Logging in from Tuesday, October 31 through Monday, November 5 will give players a free Knights of the Frozen Throne card pack and a second free Arena ticket. 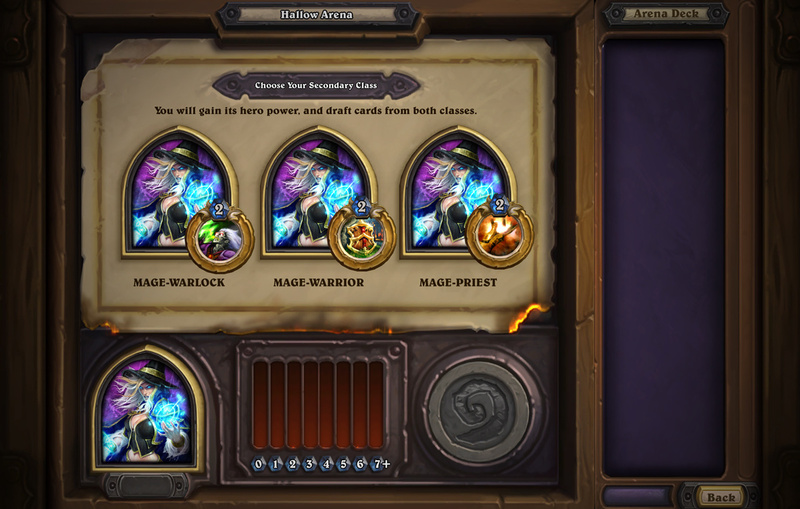 Why is Blizzard suddenly giving away free Arena runs? Because Arena's getting a special overhaul for that two-week period. The dual-class Arena mode will run from October 24 through November 6. This adds some additional choices to the Arena formula by having players select from a Hero, a Hero Power from a completely different class, and the ability to choose cards from both of those classes. The nine classic Hearthstone Heroes will also be decked out in costume for these two weeks. More details on Hearthstone's Hallows End festivities can be found on the Hearthstone website. These also include the latest Hearthstone patch notes. Look for a breakdown on those later today.